Once again, it is 8am on Christmas morning, the sky is blue, Mount Fuji is visible in the distance, and Mayuki is still asleep. She was really excited last night, and put her stocking on the top of the bed, but now she is sound asleep. 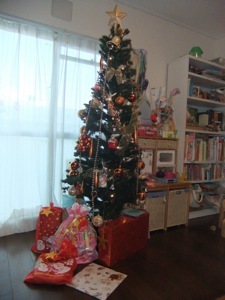 The presents have been building up under the tree for a couple of weeks. Every time a new one was added, Mayuki asked “Is it for me?”, and was very excited when it was. However, she hasn’t been trying to peek inside. She even hid one of her dolls among the presents for me to find, without trying to look inside and see what the presents were. This is not what I’d heard about five-year-olds at Christmas. I guess all children really are different. We have video chats with the US and UK booked, I’ll be making Christmas dinner all morning, and in the afternoon we’ll open our presents. We have lots of snacks for the day, as well. It should be a good family day. Merry Christmas Chart family! Hugs and kisses from Uncle Nathan, Auntie Holly, and John-John. Merry Christmas David – best wishes to Yuriko & Mayuki!